So last week I was teaching my littlest all about environments, ecosystems, and all the living and non-living things in them. Not my favorite subject, but someone has to teach it and there were no subs available in the Tuttle household that day:) Then that night a good friend of mine posed a question about church: why do we attend? I watched the answers she received with great interest, and the question so stuck with me I was even thinking about it the next morning. It was as I lay in bed pondering that my youngest's science lesson collided with my friend's question. And then I began to think about how in Titus it talks about the older teaching the younger, being examples for them as they grow. 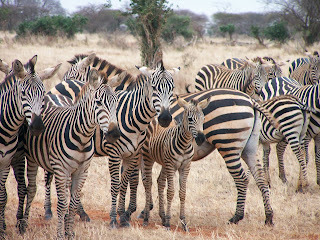 As verse after verse about how we are called to help one another rose in my mind, I began to think how smart that pack of zebras was. What amazed me even more is how God truly created everything in nature as a picture of His perfect plan. Bottom line? We go to church to praise, for sure. We go to church to take a dedicated moment of our busy weeks to connect with God. We go to church to grow and learn. But we also go to church for the community it builds around us. God is relational. He didn't create us to be alone on this earth. I mean, if that were the case he'd never have created Eve. But God didn't think it was good for man to be alone. Can people in the church hurt us? For sure. Whenever you're dealing with people there's the chance of getting hurt. They are messy, imperfect, and rough on the edges...just like a pack of wild animals. But those wild animals seem to be onto something, because even when church resembles the rough edges more than the smooth, hopefully the people there are growing and connecting with grace. Circling around those under attack. Using their wisdom to help those spiritually younger than them. They are out there. I've seen both sides and can honestly say to you, loving churches are out there. Not perfect churches, but churches so full of God's love that it spills over from them and splashes all over you the minute you walk through their door. Don't let yourself wander alone because of a bad experience when God so wants you to be part of a community. For someone who falls alone is in real trouble. Be where a hand is waiting to hold you up. Church. If you live in the West Michigan area come check out Grand Rapids First. But if you're from out of town and looking for a church in your area, check out Faith Happenings. Wow! Loved this post so much. Truth and hope all wrapped in one, which is my favorite kind of post!Thanks for sharing. Thanks for providing the seed:) It really made me think! I invited my youngest son to go to church with me this Sunday. He attends a Christian college and leads a small group and has chapel twice a week so he has opportunities to worship. Did I mention chapel is mandatory? But Scott decided to come to our church. There's just something extra special about worshiping in church on Sunday mornings for me. And to have family around makes it more special, whether we're related by blood or by the Spirit. Thanks for sharing. Next time somebody asks me why attend church, I'll remember your post. I agree. And I love being there with my kiddos around me too:) Bet you had a huge smile, Jackie! Yes, I did. We've got to cherish the special times to remember when we're in the valleys.